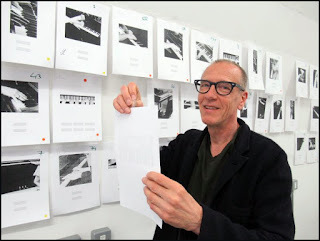 Christian Marclay è al centro di speciali attenzioni nell'edizione di quest'anno del prestigioso Huddersfield Contemporary Music Festival, in calendario dal 16 al 25 novembre prossimi. Tra gli interpreti e i collaboratori in maggiore evidenza al suo fianco ci sono Steve Beresford, John Butcher, Okkyung Lee, Thurston Moore e Shelley Hirsch. Il programma dettagliato è in https://hcmf.co.uk. The internationally recognised Swiss-American visual artist and composer Christian Marclay is to be Composer in Residence at the 2018 Huddersfield Contemporary Music Festival (hcmf//) which runs from Friday 16 November-Sunday 25 November. Now in its 41st year, hcmf// is the UK’s leading contemporary music festival and takes place across venues in and around Huddersfield over 10 days every November. Regarded as a weather-vane for the state of contemporary music in all its forms, the festival is a must for audiences, composers, ensembles and commentators from all over the world. Arguably, art and music have been sharing a gene pool since the ‘60s, but the invitation to Christian Marclay represents a yet more radical departure for the 40 year-old festival, which continues to challenge accepted notions of what contemporary music can be. His residency at hcmf// will include the world premiere of a new work featuring 20 pianos – Investigations – produced by hcmf//. The festival will also present an exhibition of graphic scores and documentation of past performances by Marclay running throughout the ten days. Marclay and some of his closest collaborators, including former Sonic Youth guitarist Thurston Moore, the extraordinary vocalist and performer Shelley Hirsch and master improviser-saxophonist John Butcher, will present improvisations and performances of existing scores.